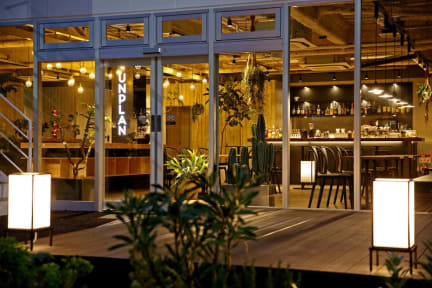 Located in the heart of Kagurazaka, our hostel Unplan brings to you a space where anyone can sit back and relax, whether they are new to, revisiting, or residing in Japan. Lovers of travel, the overseas, and Japan. To those who cherish their once-in-a-lifetime encounters, and those who prefer “journeys” to “travel,” why not give the “Unplan” experience a try? Our lounge on the 1st floor is open all day from 08:00. It is not restricted to our hostel guests, so anyone is welcome to come in and have a drink at our bar and café. In the evening, you can try Japanese beer, Japanese whisky and some cocktels with homemade meal. We provide free breakfast for our guests from 08:00 to 10:00, which includes bread, eggs and coffee. At Unplan, we have four different types of rooms, including dormitories and private rooms. Our dormitory beds, while compact, pay attention to detail, providing the most comfortable sleeping experience even in a minimum amount of space. Our private rooms provide the same amount of comfort as your bedroom at home. 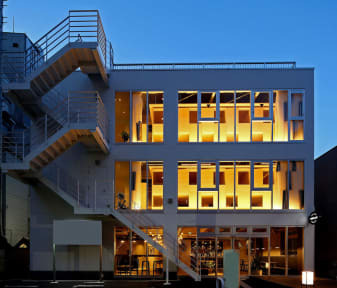 Attached to these rooms are terraces with a view of the Tokyo Sky Tree.